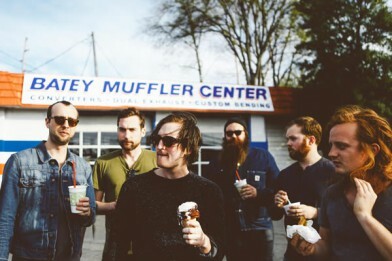 The Apache Relay are one of the most exciting contemporary names to come out of Nashville. The boys are set to swagger into the UK on a juggernaut of gritty Americana/Pop and Roots with the release of their second, self-titled album via German independent label Membran on 6th April. ‘The Apache Relay’ will be preceded by the group’s debut UK single ‘Katie Queen Of Tennessee’ (out on 6th April 2015). The album is already out in the US, where the band have toured with the likes of Jenny Lewis, Mumford & Sons and performed at festivals such as Bonnaroo, Newport Folk Festival, Firefly Music Festival and Voodoo Music Experience among others. They recently toured the UK with NME faves The Weeks. The Apache Relay are; Michael Ford Jr (vocals / guitar), Ben Ford (bass / vocals), Mike Harris (guitar / vocals), Brett Moore (keyboards / guitar/ mandolin), Kellen Wenrich (fiddle / keyboards) and Steve Smith (drums). Their critically acclaimed debut album, ‘American Nomad’, was released Stateside in 2011. Following a relentless touring schedule, the writing sessions for the new album were the first time the Nashville-based group had stopped to catch their breath in years. Inspired by the disparate likes of Richard Swift and Shelby Lynne, and working with producer Kevin Augunas at Fairfax Recordings, (formerly known as the famous California studio ‘Sound City’ (Tom Petty/Kurt Cobain)), ‘The Apache Relay’ shows a band eager to push past perceived boundaries with a commitment to continually evolving their sound. The record features string arrangements by the legendary Jimmie Haskell (‘Ode To Billie Joe’, ‘Bridge Over Troubled Water’) and collaborations with songwriter Jonathan Rice.